The eyes on the world will be on the most fashionable red carpet of the year tonight as celebutants and living legends attend the 86th Academy Awards. It’s no surprise, then, that one of the most fashionable locales in Newport, Muse at Vanderbilt Grace, has debuted a special craft cocktail menu toasting five of the Best Picture nominees. I headed over to the beautiful baby blue bar at Muse this week along with nationally-recognized lifestyle blogger Cynthia from TheDailyBasics.com to sample some of the luscious libations. The “Newport Hustle,” a play on American Hustle, sang to me as it is comprised of 1 mint sprig, 1 lemon slice, 1 orange slice, 1 cucumber wheel, half a strawberry (that totally counts as my daily fruit and veggie intake, right?) which is all muddled together with a ½ oz. of lemon juice, 2 oz. of Pimms and ½ oz. of Grand Marnier. Next, the concoction is shaken, poured over ice and capped with 3oz. of ginger beer. Cynthia paid homage to her family members stationed in Texas by sampling the “Dallas Fashion Club,” a sassy combination of muddled jalapenos and orange, and house-made chipotle barbeque bitters mixed with 2 oz. whiskey served in a rocks glass and garnished with jalapenos and cilantro. Hee-haw! We also sampled the “Her OS,” a refreshing and diet-friendly cocktail of 1 oz. Absolute and 1 oz. Chambord topped with soda water, served in a Collins glass and garnished with raspberries. Other cocktails include the “Captain Morgan Phillips”: 1.5 oz. Captain Morgan, ½ oz. Grand Marnier, and 2 oz. pineapple juice served in a Collins glass and garnished with wedges of lemon and lime. Finally, there’s the “Zero Gravity”: 2 oz. Absolute, 1 oz. peach liquor and 2 oz. of orange juice shaken and strained into a martini glass with grenadine on the bottom and topped with Blue Curacao. 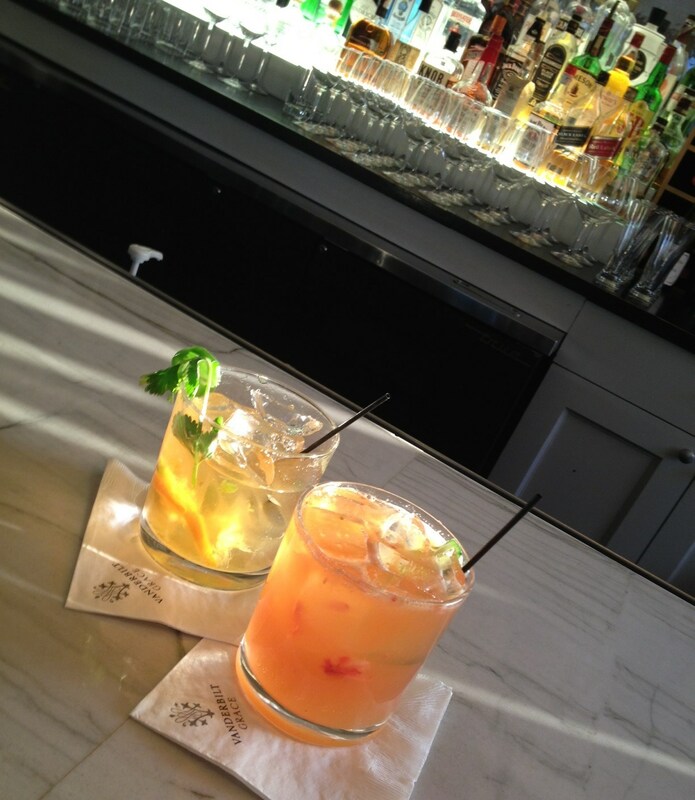 Toast the Oscars at Vanderbilt Grace with one of these whimsical cocktails ($14), served after 7pm. 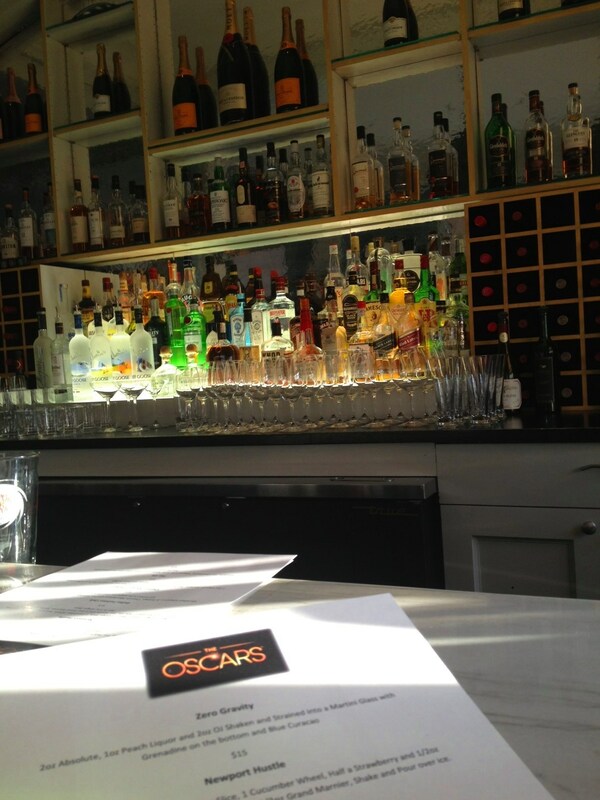 Meanwhile, over at The Chanler, the bar at The Spiced Pear is also feteing the Oscars with a special libation. The “Cliff Walk” Wolf includes 1 oz. Absolut Pear Vodka, ½ oz. Chambord, 1 oz. Absolut Razberi and ¾ oz. of cranberry juice that’s shaken with ice then strained into a martini glass. If you want to weigh in on red carpet fashion during Oscar arrivals, I’ll be Tweeting (@newportstyle) with other style bloggers with hashtag #oscarfash14 from 7-8pm.